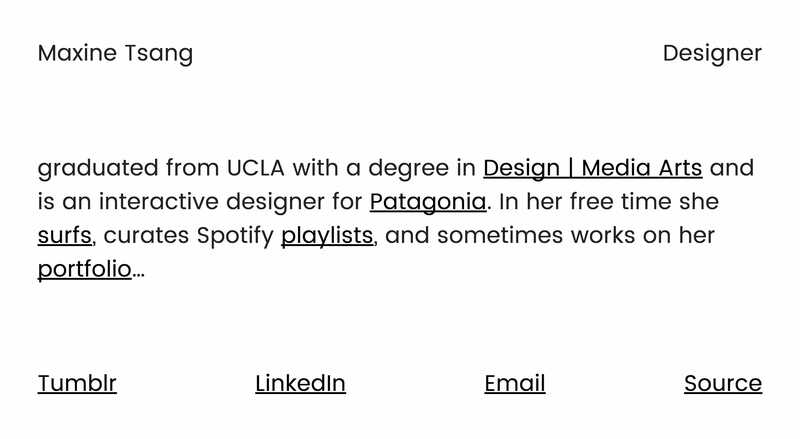 Minimal personal One Pager for Maxine Tsang – an interactive designer over at Patagonia. I dig how a massive GIF loads in the background when hovering over her biography links. The surf and playlist links are good references to bringing out personality even in a simple site. Cheers for the build notes! I wanted to do make super low-maintenance splash page using little to no effort. So my good friend, Christian Gimber, and I sat down at a boba place and did not move for 9 hours straight (so much for no effort). But we conceptualized, designed, and coded the entire thing in one sitting; and we enjoyed every second of it. Christian developed the site and gave design feedback while I handled the creative, layout, interactions, and content. This ultimately dictated both the beauty and simplicity of the design.